Which Young People Need Extra Help to Reach Good Health? Not all young people find it easy to access healthcare. There are many vulnerable and marginalised young people who are facing adversity and need additional help to attain good health. This poster highlights some groups of young people whose background and needs might not be obvious. 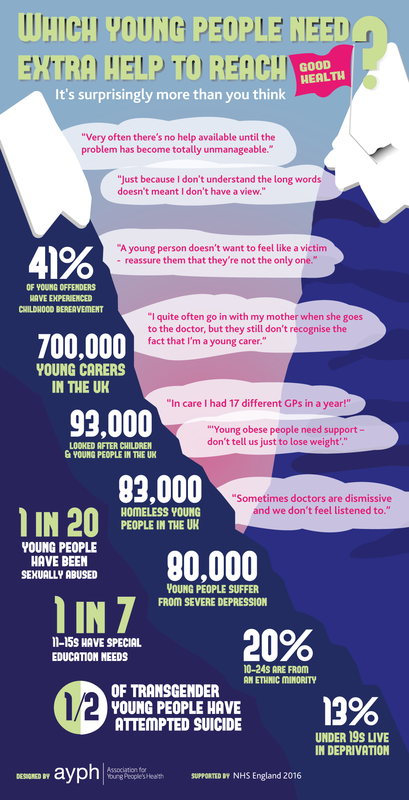 This information can be used to improve practice around vulnerable and marginalised young people and to reduce health inequalities. This poster could be displayed in GP surgery receptions, emergency departments, outpatient settings and ward environments. 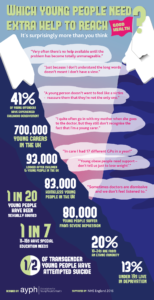 The poster was produced by NHS England and the Assocation for Young People’s Health.